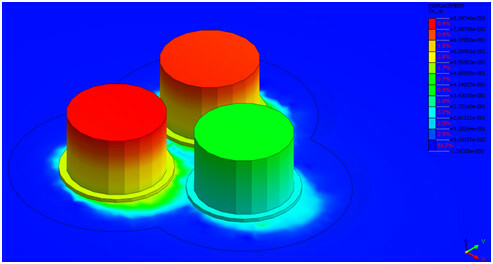 A 3-dimensional model has been developed with Midas-GTS-NX software, which concludes that safety factors for bearing capacity are higher than one for the designed bedding layer. From the 3-dimensional model developed with Midas-GTS-NX software to check the service limit state (settlements, angular distortion, etc) for the minimum length of over-width at foundation level of 10 meters complies with the SLS requirements. Only the cases with the loads acting perpendicular to the side of the caisson are considered in the study, as for given the orientation of the caisson on site and the direction of the environmental loads, the most unfavourable case will be when the waves act perpendicularly to the side of the caisson. In the displacements and deformation analysis, for the wave loading step, the deformation module is divided by two to account for the cyclic effect. The design is acceptable in terms of sliding, bearing capacity, rigid overturning and estimation of settlements.